From the Simplified Chinese character - 东, there will be no clue at all about what it means. Luckily we still have the Traditional Chinese character - 東 (日 in the midst of a 木). Before the answer is revealed, a story need to be told first. 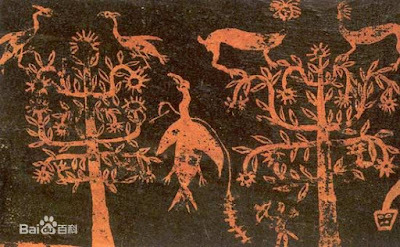 When Chinese ancestors observed the sunspot on the surface of sun, they thought that was an immortal crow, who drove for the sun in the sky. While in the midst of far east China Sea, there was a huge tree called "扶桑" growing upon the sea. Each day the immortal crow would wake up from the "扶桑" tree to lead the sun to shine upon the earth. 東 was created referring to above story. the 木 in the Chinese character 東 is not a normal tree, but the greatest tree named 扶桑 standing in the east. So 東 means "the place the sun rising from", which is East. English word Orient was created in a similar way - O (the sun) + ri (rise) + ent (place). Only difference is that Chinese ancestors utilized a fairy story to display the same idea. Once you know this story, you would not be surprised to see Chinese character for West is related to a bird and its nest, which was referring to the immortal crow actually.